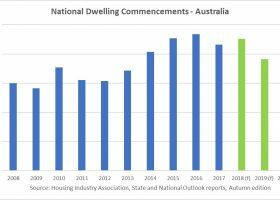 Construction approvals have suffered their largest setback since September 2014 as the huge surge in high density dwellings eases. Approvals for the construction of new homes fell 8.2 per cent in June, way worse than market expectations of a 0.9 per cent fall. Over the 12 months to June, building approvals were up 8.6 per cent, the Australian Bureau of Statistics said. Approvals for private sector houses rose 4.3 per cent in the month, and the ‘other dwellings’ category, which includes apartment blocks and townhouses, was down 20.4 per cent. JP Morgan economist Tom Kennedy said the underlying details in the building approvals figures aren’t that bad, but he doesn’t expect it to significantly strengthen again this year. “It’s unlikely that you’ll see any further increase in approvals volumes, you’ll probably see them hover around the current levels for a while,” he said. CommSec economist Savanth Sebastian said the fall in the number of building approvals was not a surprise given the recent decline in the number of home loan approvals. “We’ve only had one month, it is still a hot sector but there does seem to be a few cracks appearing,” he said. June 2015 approvals for apartments and non-residential buildings in NSW have dropped 20% since February 2015, says the Urban Taskforce. When you look at the seasonally adjusted number of approvals from last month (17,868), that implies an annual build rate (assuming all dwellings approved make it into construction) of around 214,416 around the nation – down from the sky-high levels of recent months but not a terrible build rate considering we have broken ground on more than 180,000 dwellings only on two occasions over the past 30 or so years. Given that, I respectfully do not share in any opinion which sees the latest figures as 'worrying'. That term should be used when we are seeing annualised approval rates of around 150,000 per year, not 214,000 plus.